Water is such a fundamental part of life, yet so often we take it for granted. Imagine if you had to walk 5km to fetch water for your family for drinking, washing and cooking, and then walking that journey along a dusty, rocky path or dangerous road, which involved climbing a steep hill, and all this with nothing on your feet. Imagine if, when you eventually got there, the water itself was from a filthy polluted stream. Then the return journey would have to be made, lugging the heavy containers on your head or your back all the way. This is what many children and women in Africa have to do every day in order to survive. FROM STONES TO WATER is a project started single-handedly by Daphne Brown in June 1999 to help villagers in desperate need in two African countries where there is no water supply. 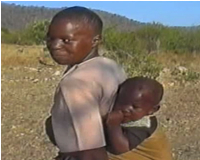 To date she has raised enough money to supply 30 boreholes and where possible she has visited the villages in person to see how life was before and after the water supply was installed. An added bonus is that the villagers are able to use the water supply to irrigate crops, which in turn can be sold to pay for the childrenís education, as well as providing a nutritious food supply. 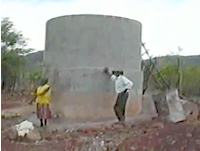 The name of the project was inspired by the process of installing a borehole in Zimbabwe. Once a surveyor finds the location of the best water supply, sometimes hundreds of feet below the ground, the local people lay a pile of large stones to mark the spot where the borehole is to be dug. Retired headteacher and has now worked for 13 years as a counsellor in Primary Care at a GPís surgery, in Hertfordshire, as well as working in a local hospice. Daphne is continuing her fund raising work. She is always happy to visit groups or schools to show her videos and talk about her project, providing they are reasonably near to Hertfordshire. There is no fixed charge for these visits - just a contribution towards her work and also the refund of her travelling expenses. Joomla template created with Artisteer by Daphne Brown.